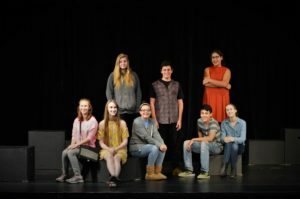 The cast and crew of Hamilton High School’s one-act play, “Selfies” by Bradley Hayward, received an All State Award at the 2017 State High School Theater Festival hosted at University of Wisconsin-Whitewater. The All State Award was one of nine awards earned by the team. The entire cast was awarded Outstanding Ensemble and six cast members received Outstanding Acting Awards. They were Ariel Hoefler, Kayleigh Winston, Ashley Bissen, Jonathon Costa, Dorie Palmer and Joseph Davila. In addition, Linda Schuster Hake won an Outstanding Director Award.